Greetings to our school family! Our Back-to-School night will begin with a general meeting in the Chapel @ 6:30 on Thursday, August 30. The information you will be given includes our Scrip program, dress code and our online grading program. Following this meeting, there will be two, fifteen minute periods for you to visit your child’s classroom, meet the teacher and hear such things as classroom rules, grading and discipline policies and activities planned for the year that you can help with. My door is always open for questions, visits or personal needs. I look forward to working with you in the education of your children this year. As a body of believers, we are called upon to be constantly in prayer (I Thess. 5:17). These weekly notes will list different prayer items that I hope you will remember as you spend time in prayer each day. There are always more prayer items than listed, but we ask that you give special attention to these! Please pray daily for your child, his/her teacher and class. Please remember to pray for the Bike A Thon. That we would have good weather and a great time. Please remember all the students and staff who are not feeling well. That they would have a speedy recovery. Congratulations to all of our Students of the Week. Good Job! Crusader of the month was given out this week at the chapel for the fruit of “Peace.” Congratulations to these students for their loving spirits. This months Fruit of the Spirit is Patience, so be patient! 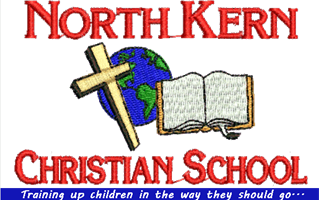 North Kern Christian School / Copyright © 2011. All Rights Reserved.